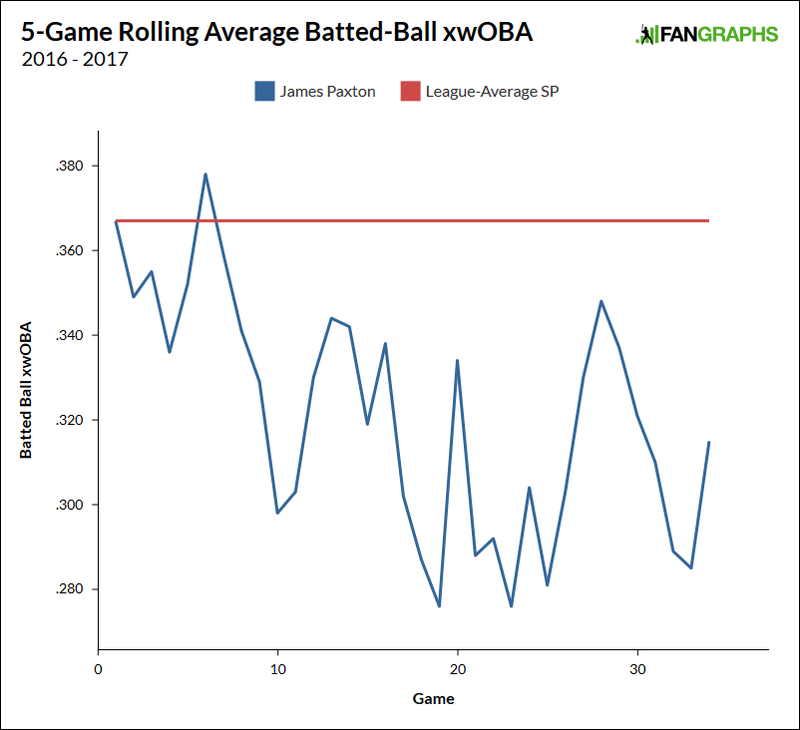 James Paxton had a pretty bad June. His season got off to a wonderful start, but then he landed on the DL, and shortly after his return, the calendar flipped and pitching was hard again. Paxton in June ran a 7+ ERA, and opponents blasted him to the tune of a .395 wOBA. Something appeared to be seriously wrong, but Paxton blamed his mechanics, and not his health. He found that he had some straightening out to do. For me, one of the fundamental markers of greatness is the ability to adjust on the fly. It’s one thing to play well, but it’s quite another to play well, then struggle, then get back to playing well again. We’ve recently seen this with, say, Rich Hill. And, of course, we’ve seen this with Paxton. Paxton started six games in July, and he won each of them. He issued a total of just six walks, and he trimmed that .395 June wOBA almost literally in half. Paxton has gotten himself back on track, and I don’t know what more evidence people might need. James Paxton is extremely good. He is sufficiently proven. One could occupy the perfectly defensible position that Paxton could stand to stay away from the disabled list. Health questions tend to take a while before they go away, so Paxton to some extent is dogged by his history. He’s not alone in that regard, and lately, he’s mostly been able to pitch. He has pitched very well, dating back to his major-league return in June of 2016. Paxton’s adjustments were well documented around the time — in the previous offseason, he worked hard to improve his conditioning, and then he went to Triple-A and lowered his arm slot. He found new velocity, and he found new control. He experienced one of the more staggering year-to-year control improvements in recent seasons. Paxton has made 38 starts since coming back. Those have spanned nearly 230 innings. He’s demonstrated that he can get strikeouts, and this year he’s improved his contact rate. He’s also demonstrated that he can avoid walks, and while his current walk rate is up a few points, he’s not missing any first-pitch strikes, or pitches in the zone. Paxton checks off those boxes, but there’s also a third, one that’s drawn relatively little attention. This is along the same lines as the post I wrote about the Dodgers’ pitching staff Tuesday afternoon. In between the strikeouts and walks, Paxton has to deal with batted-ball contact. That appears to be just another strength of his. One more time, I’m borrowing liberally from Baseball Savant. I’m drawn to its expected-wOBA metric, based on batted-ball speed and direction. Although it’s a number that could undergo further study, for purposes of validation, it makes intuitive sense. Why not explore? So that’s what I did, looking at 2017 starting pitchers. I searched for expected wOBA on batted balls for starters, setting a minimum of 250 tracked at-bats. James Paxton shows up at .305. His just happens to be the lowest number in the list. Paxton, in other words, currently ranks No. 1. He’s allowed what you’d expect to be the least-damaging batted balls. In reality, this can be a noisy stat — correlations appear to be weak. So I looked at 2016 as well, to try to increase the sample size. Paxton, a year ago, ranked in the 78th percentile among starters. So, worse, but still good. Combining 2016 and 2017 together, Paxton ranks in the 96th percentile. Here is a table of the best. Starting pitchers, 2016 – 2017. There’s Paxton, in fifth place. As volatile as this statistic can be, the volatility is reduced over larger and larger samples, so we have increasing reason to believe this is really something Paxton is able to do. To give you a further idea, here’s a rolling-average plot. The league-average starter, the last two years, has allowed a batted-ball xwOBA of .367. The blue line you see is Paxton, in five-game rolling spurts. Paxton has stayed away from the red line, and while his own numbers have bounced around, he’s maintained a pretty healthy distance between his own mark and the average. To consider this in other terms, you might be aware of the “Barrels” category that Statcast tracks. A barrel is, basically, a very well-hit batted ball. Barrels comprise many of the most dangerous batted balls. Since the start of last season, Paxton has allowed baseball’s second-lowest rate of barrels per batted ball, with a rate that’s basically half the league average. Paxton, by whatever means, has simply avoided consistent hard contact, and you can even see that indirectly, if you note that Paxton has allowed only 14 home runs while generating 20 infield pop-ups. Only Brandon McCarthy and Rich Hill have allowed a lower rate of home runs per fly. Just because I don’t know why it’s happening doesn’t mean it isn’t happening. You’ve got the strikeouts. You’ve got the walks. You’ve got the contact control. You can put it all together and look at Baseball Savant’s overall expected wOBA. Here’s the top of that list, again for starters, again combining 2016 and 2017. James Paxton, fourth place, and first place in the American League. That shouldn’t be interpreted to mean that Paxton is currently the best starter in the AL, since, say, Sale has gotten better, but it at least wouldn’t be an argument without any evidence. You could build a flimsy but modestly convincing case, which is saying something, given where Paxton has been. Some time ago he became the ace of the Mariners’ rotation, but he’s also graduated to become more than that, somewhere in the past weeks or months. He’s going to need his health in order to continue, but so will every other pitcher, and so will you and I. When it comes to trying to explain the contact suppression, I’m not sure how well the process is understood. Paxton is a big lefty with electric stuff, so that presumably plays some kind of role, and he also hides the ball behind his back, so he could be deceptive. Then there’s the matter of how his pitches work together, through various locations and tunnels and whatnot. The most I can say for now is that Paxton is doing *something* right. He’s doing a lot of things right. He’s doing everything an ace needs to do, and he’s practically dragging this rotation into the playoff hunt on his own. We hoped you liked reading Let’s All Agree That James Paxton Is One of the Best Pitchers Around by Jeff Sullivan! How big a role does of defense play in these stats? I’d imagine a small but significant one. xwOBA is designed to be as defense neutral as possible. None. Almost all metrics on this site are designed to remove that; the sabermetrics/advanced stats that this site it based on were borne out of fielding-independent pitching stats (FIP). Oh, right. It’s based on batted ball speed and direction, not results. I wonder if defensive shifts would put some small portion of that theory into question? Imagine giving the same value to a right handed hitter pulling a ground ball to the shortstop as a ground-ball through the 3-4 hole. There is a lot lost in the Statcast approach to judging batted balls. The difference is that guys try to hit balls through the opposite side hole. Nobody tries to bloop one in between two fielders. Guys make the Hall of Fame by hitting ground balls up the middle and through the right side. Nobody has done much for themselves by hitting a lucky fly-ball. You do have a point, but I am willing to wager that you didn’t play a lot of baseball with that perspective. I was the best player on my high school team and I’m an admittedly terrible baseball player (coincidentally I’m a RH batter with an opposite field stroke). If I was more athletic would I be able to understand baseball better? What’s your point? xWoba isn’t the greatest metric in the world but your argument is not a meaningful critique of its flaws. Why did you hit the ball the other way? It would have been easier to just yank everything into the strong side of the defense. I don’t see how you don’t understand that. Apparently it worked as you had success. Honestly, I don’t understand a word of your critique of my comment. I have zero doubt that the horizontal angle is important. We look at exit velo, and vertical angle, but not horizontal angle? That is one of the more important parts of a scouting report, we call it pull, cent, oppo… its right there on the FanGraphs stats page. What are you even trying to say? You think ground balls hit the other way are as successful as those that are pulled? That is why I said you probably didn’t play baseball – because that’s the only way you wouldn’t understand that point. What makes that type of metric even sillier is that pulled stuff will have a higher exit velo, than non-pulled balls. According to Statcast they would grade out higher, even though they are less likely to do something positive. Maybe back in the 1800s, look around the HOF now and you will see a whole lot more fly ball hitters than ground ball hitters. Ichiro types are the exception not the rule. Is that right? Your window is off by about a hundred years. One guy did, which makes it true enough. So did this fellow named Tony Gwynn. Corey Seager led the league in oppo hits last year (I think). Daniel Murphy succeeds to large degree because he used the entire field. Guys that hit for average use the entire field generally. When Bryce Harper is going good, he sprays the ball. I don’t think you know what you are talking about. Ground balls are a part of everyone’s ball distribution – without them what would a guy’s average be?